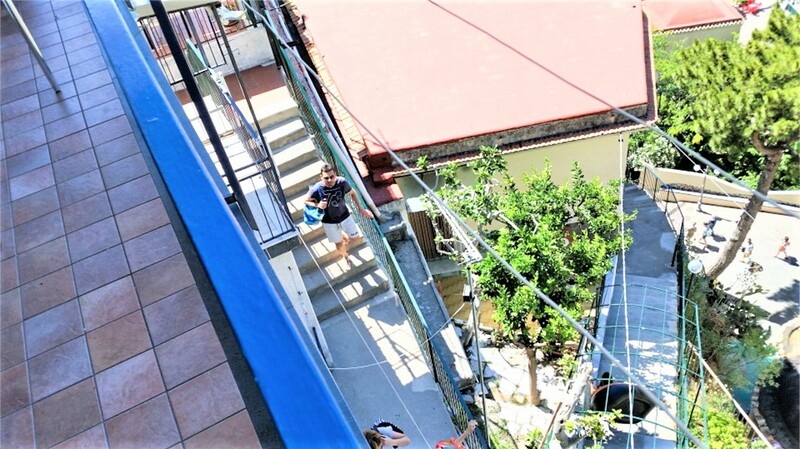 Casa Rosalia is a nice apartment on two floors built on rocky slopes, some fifty meters high above the beach. From its dominant position Casa Rosalia overlooks the village of Erchie and the entire bay. Enjoy sunrise on the sea from your bed and a majestic sea horizon view from the balcony. Walk down to the beach using the private stairway and relax by the sea. 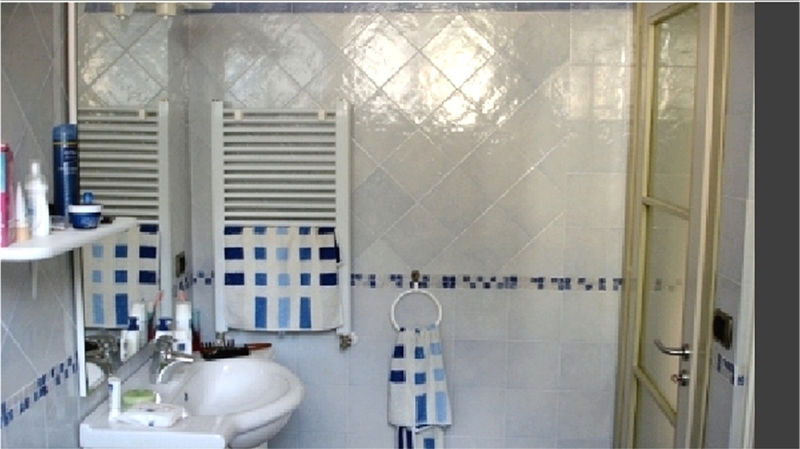 The apartment, of 95 square meters, is within a private, gated property, on two floors. 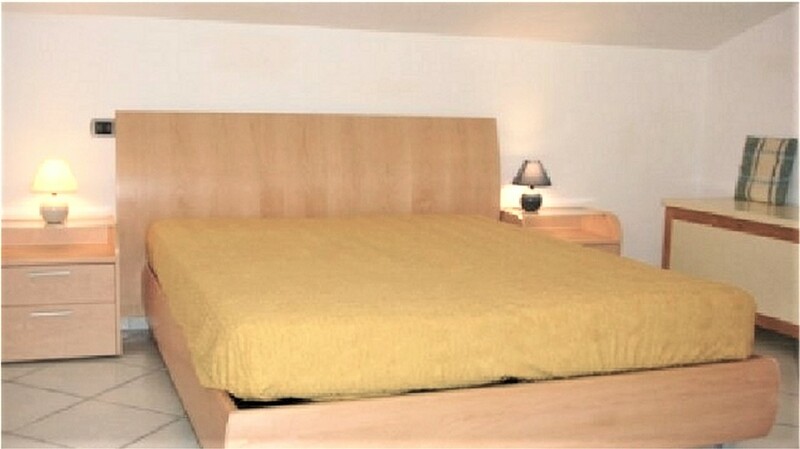 It’s new, comfortable, with elegant modern furniture, very light, sunny with a balcony facing the sea. Featuring two bedrooms on different floors with comfortable king-size double beds, private toilette for the bedroom upstairs, open space sitting room, kitchen with all appliances dishwasher included, bathroom with combined bath tub-shower, bidet, washing machine, independent central heating, air conditioning, Wi-Fi (from May to October), 42-inch LED TV with integrated satellite and digital receiver, PRIVATE CLOSED GARAGE. 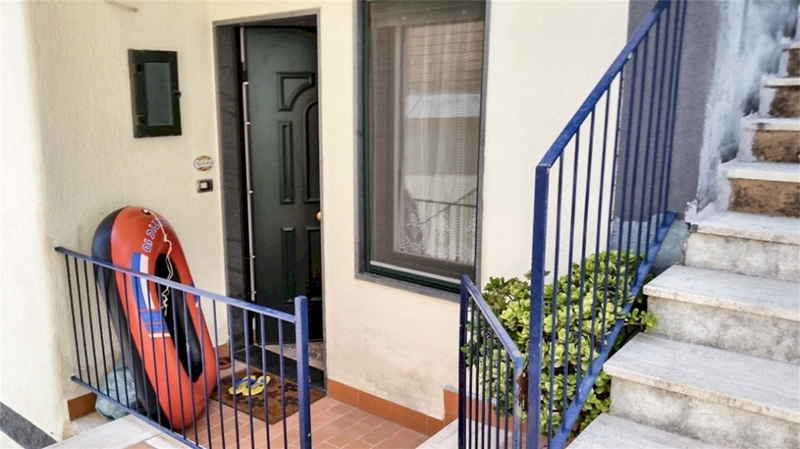 When comparing prices with other accommodations on the Amalfi Coast, please, consider that my rental prices (see below) include the house private closed garage. On the coast only a few house rentals include the garage or a parking place. Unfortunately, for the narrowness of the roads, it is not possible to park just along the streets and, depending on the season, an open parking place could cost up to 150 euro per week. Wir haben schon einige Fewos gemietet - auch wirklich schöne - aber diese ist wahrscheinlich nicht mehr zu überbieten. Alles Positve der Vor"schreiber", trifft zu. Ganz besonders aber möchte ich den örtlichen Kontaktmann - Hr. Francesco von Ce.Tour und seine Frau - belobigen. Er spricht sehr gut deutsch und ist eine Seele von Mensch und behilflich weit über das normale Maß hinaus. Man ist also bestens aufgehoben. Our holiday in Erchie was very pleasant, we enjoyed the little town and Casa Rosalia, which is so conveniently located near the beach, which is so charming. We hired a pedalo and a kanu twice, definitely fun with our children of 8 and 9. 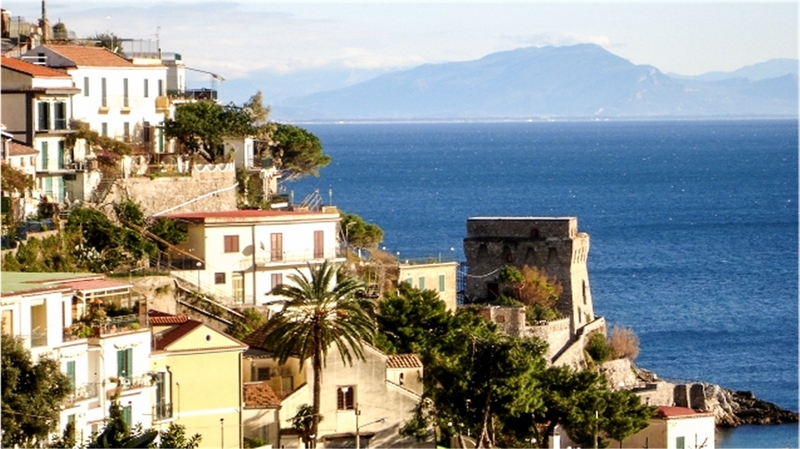 We also made a couple of trips along the coast, but also to Ercolano and Napoli, as well as to Salerno. It is very convenient to be able to park the car in the garage. We'll cherish our experiences in Erchie and I'm sure one day we'd like to visit the Amalfi Coast and Casa Rosalia again! We have very much enjoyed our stay at Casa Rosalia. It's lovely. And Erchie is a sweet and gentle place, as my wife says. We are very lucky to have spent a week here. I have to say that the absence of English speakers in the village (despite us obviously) was wonderful and I'm not sure Erchie needs more of us. 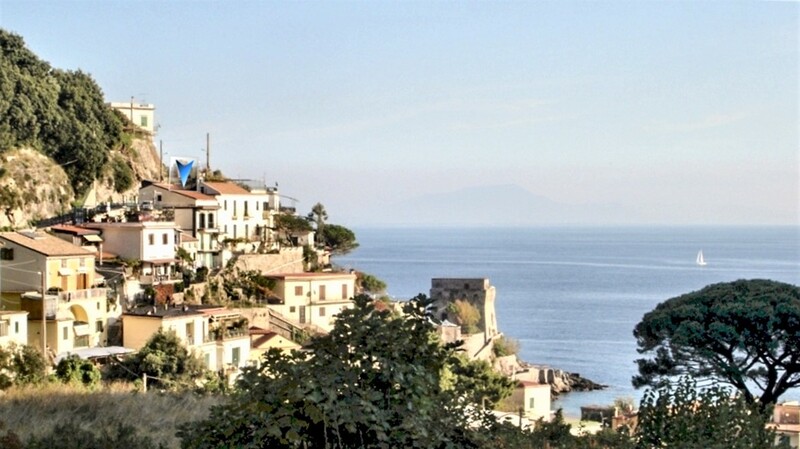 It would be awful for Erchie to turn into something like Positano. By the way, both restaurant recommendations in Cetara were fantastic. Thank you again for sharing your lovely apartment. Perfect location and a wonderful view. We very much liked our stay in this nice and well-equipped apartment. And having a garage was a real asset. For restaurants and shopping we would recommend going to neighboring Cetara, Restaurant San Pietro and Gigino's grocery store are a must. A really nice and restful holiday! Dear Luigi, We were delighted by the	stay we had in your flat. The quality of the equipment was top, the beds were very comfortable, the view from the flat was lovely. 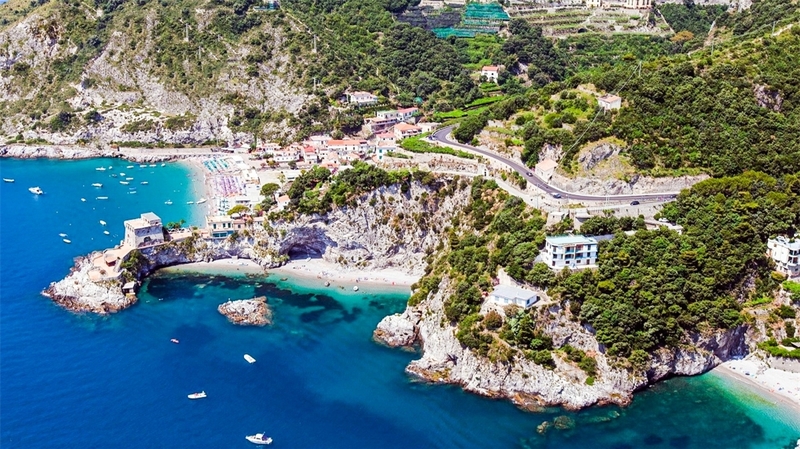 The location at the beginning of the Amalfi coast was perfect to avoid the traffic-jam (we took the bus, a real "roller-coaster" experience in summer ! ), and the proximity from the highway was nice to reach easily the outer archaeological sites. We appreciated very much the way we were kindly received by the inhabitants of Erchie: your local agent was very kind and attentionate, and we had a cool evening with him on the beach at ristorante Delfino. We discovered Ravello, Amalfi, the sites of Paestum, Herculanum, Pompei and the solfatara volcano. We also had beach sessions in Erchie for the children. They loved italian ice creams! We will have to come back to discover much more ... the museum, Capri, Napoli ...it's so rich, so splendid! This stay was a real dream. Having spent seven days in Casa Rosalia gave us the best vacation ever. 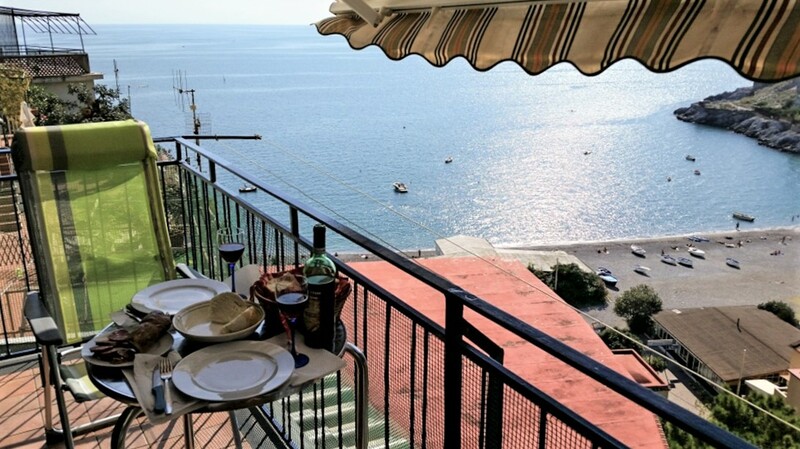 Splendid view to the Tirrenian sea on one side, and onto the village of Erchie and to the mountains on the other, really comfortable and clean apartment, ideal distance from Napoli, Pompei-Herculaneum, and the towns of the Amalfi coast. The only bad feeling	was that we had to leave Erchie and Casa Rosalia behind, for sure, temporarily. Appartement très agréable, impeccable, propre, il ne manque rien en ustensiles de cuisine, très bien équipé. 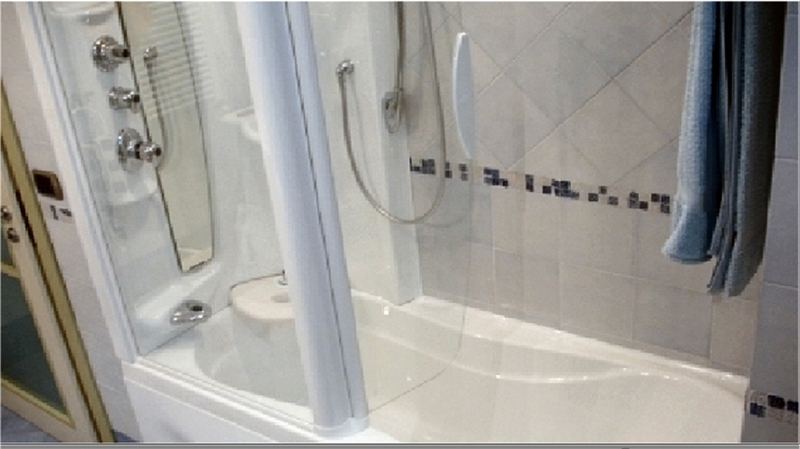 La salle de bains est spacieuse. le site est magnifique avec vue sur la mer ; Le + : le garage car c'est très difficile de se garer. Nous avons été très bien accueillis par Francesco qui a été à notre écoute. Mais il est vrai que l'accueil des habitants et commerçants nous ont surpris. Nous avions l'impression d'être de leur famille;que nous avions toujours habité ici. Nous en gardons un super souvenir que ce soit à Erchie ou Cetara l'accueil était exceptionnel. Nous y retournerons c'est sûr. En ce qui concerne les entretiens par mail avec le propriétaire Luigi : très réactif, il a répondu aussitôt à mes mails, très aimable merci encore pour cette magnifique semaine. We are now home after a	wonderful three months in Europe.One of our loveliest stays was at Apartment Rosalia. We loved Erchie and we were all very sorry we	didn't stay longer. The apartment was just wonderful! It was more like a hotel stay than one of the apartments we normally rent. Clean and beautifully prepaired for our arrival. The photos on the web site do NOT do it justice. It is much nicer than in the photos. Once you are there, you realize how lovely and modern the apartment is. It was so peaceful and the views are to die for! We found all the people in Erchie very nice and very friendly towards us. In fact we had that	experience through out Italy. 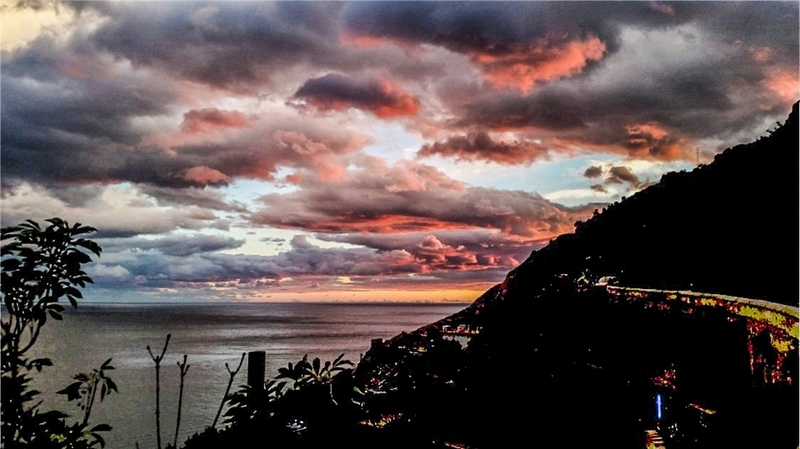 I have no hesitation in	saying that the Amalfi Coast is my most favorate place. Thank you very much for	making your lovely apartment available to us so that we may enjoy it as much as	you do. 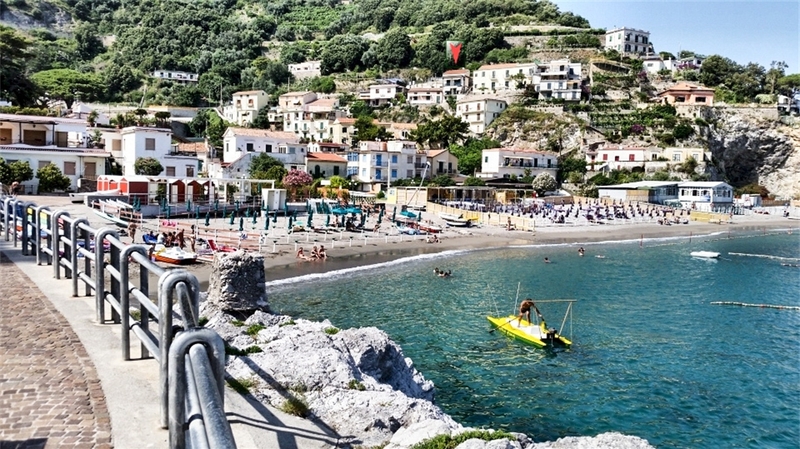 We will recommend it to all that travel to "The Amalfi Coast". If you don't like crowdy touristic places, but prefer nice and quiet, this small village is for you. We spent there 2 wonderful weeks, everything is really even better than in the pictures. The apartment is cosy and homelike, if you like to cook you can find everything you need, there is a beatiful view from the balcony. The beach is nice, the fruits and vegetables are tasty! The people are friendly! We even liked the steps you have to use whenever you go, at least you can move not just sit and eat! We all were so happy there! Hope to come back one day. We are back in Sweden after two weeks on the Amalfi-coast, staying in Erchie the last week. We really enjoyed the staying at Casa Rosalia. It seemes to us like only the best materials have been used when fixing the apartment, from the floors to the furniture. And we liked the kitchen a lot. It was very good, which is not easy to see on the pictures. Offcourse the balcony is fantastic with the sunshades making it possible to use all day. We had a car and how good it is to have your own garage in the house probably just those who have been to the Amalfi-coast understand. So I would recomend the apartment to anyone who wants to experience "the sweetness of doing nothing". Mr. Di Bianco, I want to tell you what a wonderful time we had at your apartment in Erchie. It is a special place. The town is the perfect small size and we loved being there before the crowds. The apartment was perfectly suited to our family. Our boys were able to stay upstairs and we loved the view from the bedroom and living room. The locals may have gotten tired of us watching them from the balcony! It was especially helpful to have the garage for our car. I can't thank you enough and I will forward information about the apartment to several friends who are thinking of traveling to the Amafi coast. Thank you again. Helen and Jock B.